After getting breakfast ready for the kiddos I sat down with the morning newspaper and a whole wheat toaster waffle. I slowed down at the obituary section and saw a lengthy entry for S with two photos and an extended tribute to her life and family. Interesting to see the intervening 18 years or so filled by a few paragraphs, but helpful in getting a sense of her complete life as I'll be attending her memorial on Saturday with long-dormant friends. But an online component was something I'd not engaged with before. The newspaper obit gave a link to a website, Caringbridge.org, which provides a place for patients and their families to tell their stories. This morning, the page for S shared about her six-year bout with cancer, its remission, and re-emergence a year ago after it spread to several organs. It described a series of treatments and her courage and photos of her with her three children, husband, and some with her undergoing treatment including a brace on her head for removing a tumor in her brain. All of the content described her in the present tense, as it was last updated before she died. There was a video consisting mostly of a photo montage of her over the last few years, and ended with a shot within a car driving, trees alongside both sides of the street near her home with orange ribbons on them. "All of this for me?" was the caption. No voice, no faces. Only the line of trees moving by as viewed from behind the windshield. Tonight that has been scrubbed, with details by her spouse Peter about her death and cremation that happened at 4:00 p.m. today. Also newly posted: info about the funeral Mass for her Saturday, and a party following after the orange ribbons are ceremoniously removed by children associated with S and her family/friends. Not looking forward to the Mass. Organized religion interferes with the very human need to gather and confer and share with its self-serving mumbo jumbo and unprovable delusions that hold our species back. In truth, such moments are deeply meditative for me, as I try to ignore the propitiations the robed figure burbles and instead listen/watch for the genuine humanity that shines through. In going to the newspaper's website tonight the obituary section is full of ways for people to express themselves with tributes, signing an online guest book, sharing the obit out, ordering flowers, sending a gift, ordering a copy of a death certificate (weird), and making a donation (though not to the one specified by S and her family - a generic charitable organization lookup). While the extensive text of the obit and both photos were also online, the effect is really noisy. 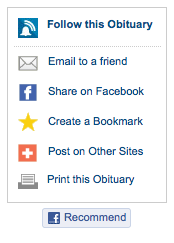 Yet, it makes sense, with obituaries online, that people would want services and online tools tied into it. With deaths, I'm accustomed to direct interactions and commisseration with others in-person, quiet, perusal of memories, laughter at moments of fond honesty, listening to eulogies or giving them, and not having technology in the hand, lap, or in front of the face. Death and grief and wakes have been strictly real life. Hands, embraces, nods, tears, smiles, laughter, celebration and NOT typing and mouse clicks. But for people not able/inclined to be at a specific place and time, having something like that online is better than nothing. it would let people contribute or participate preceding or following a service. I wonder how long her family will get notices of people encountering news of her death online weeks, months, years hence. There have been businesses around that offer a service of managing/deleting your online materials and accounts after death. Again, sensible when pondered from a distance, but inescapably ghoulish. MAKE NO MISTAKE: Despite the somber tone of these last few entries, life and mind skitter around. All day I've had the WiiFit music that accompanies the Basic Step aerobics workout. All day. Kicking again right now. While sad for extended friends about S who knew her better, I'm not distraught. A dear friend recently got some bad news that is on my mind more. It's a commonplace to observe as you get older you start turning to the obituaries first. Today was my first step in that territory. Seeing these elements to modern death is slightly interesting, but will also serve as an orientation/scouting trip for when a death occurs that hits closer to home.